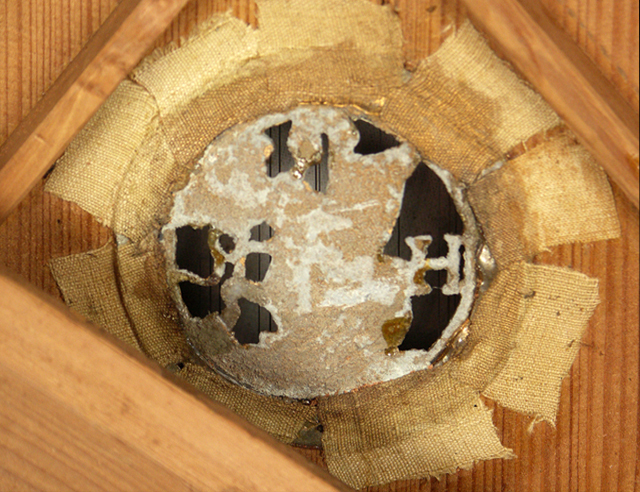 The present soundboard rosette in the instrument is about 16mm too small for the hole into which it has been placed. 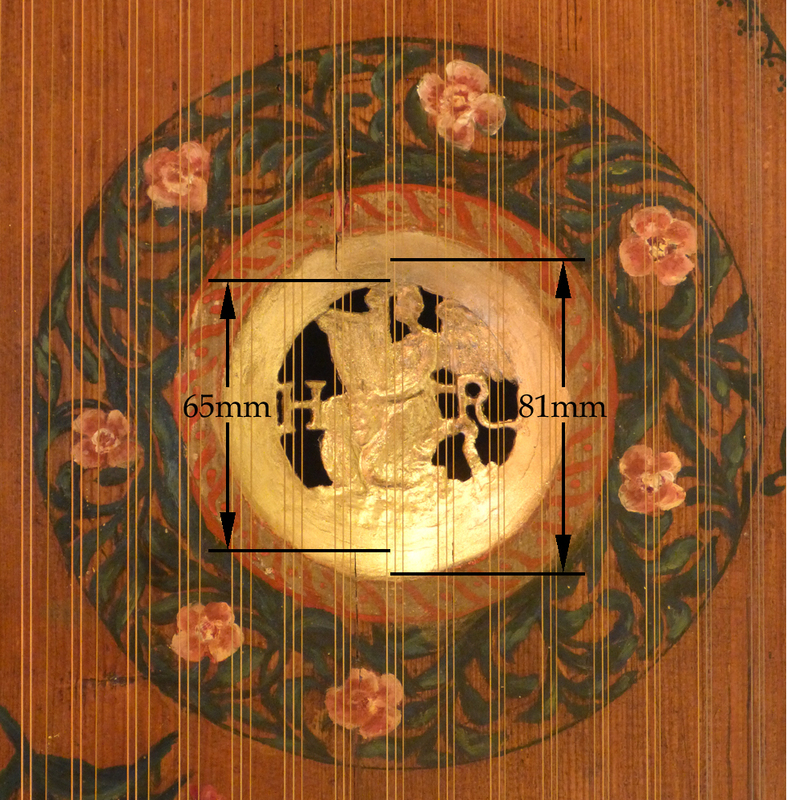 The original soundboard rosette which must have been placed in the soundboard hole in 1617 when the harpsichord was first made, was clearly larger than the one seen here. The original rosette must have been removed, probably by Francois Etienne Blanchet in 1750 when he carried out the ravalement of the instrument, and replaced by him with a genuine “HR” rosette. The replacement rosette is of the type used by Ioannes Ruckers after his father's death in 1598 and until his royal court appointment in 1614. It is very similar to that which is shown in Figure 7.24, page 160 of my book. The original border of the inside of the hole in the soundboard (81mm) can be seen clearly in places. This is considerably greater than the diameter of the Ioannes Ruckers rosette from the period 1598-1614, which has a diameter of 65mm. Because this rosette has the correct diameter and is otherwise an identical casting to the rosettes in numerous genuine Ioannes Ruckers instruments, it appears to be a genuine early Ioannes Ruckers rosette, cannibalized from an authentic Ioannes Ruckers instrument, probably a Ioannes Ruckers virginal. The gap between the edge of the rosette itself and the inside of the bevel in the soundboard wood has been filled out with gesso or some other filler in an attempt to deceive the eye into seeing only the genuine Ruckers soundboard rosette. There are also signs underneath the soundboard of the former existence of a slightly larger soundboard rosette which must have been glued into the instrument sometime before the present one. The present rosette is also not taped to the lower surface of the soundboard with the characteristic four pieces of linen cloth normally placed tangentially to the edge of the rosette as used by the members of the Ruckers/Couchet family to hold the rosette in position. Instead the rosette is held here by numerous pieces of linen glued radially all round the rosette. There can therefore be no doubt about this rosette: it is an original Ioannes Ruckers rosette, but is clearly not original to this instrument. Grant O’Brien, Ruckers. A Harpsichord and Virginal Building Tradition, (Cambridge University Press, Cambridge, 1990; digital reprint, Cambridge: Cambridge University press, 2008). This page was last revised on 14 December 2018.